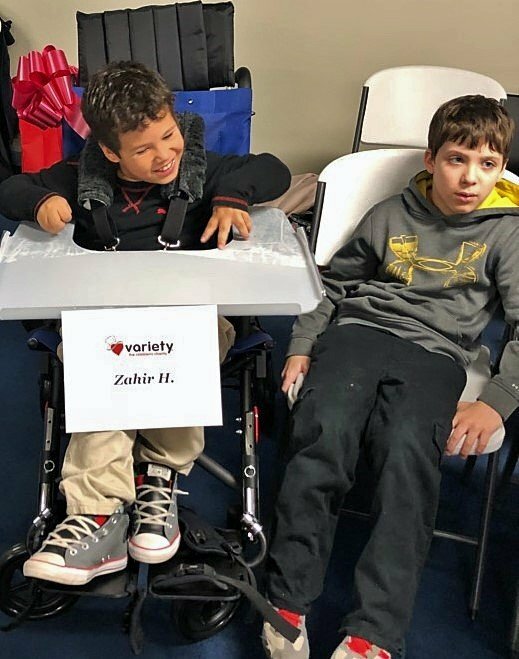 This holiday season, Variety had the chance to present more than 80 pieces of adaptive equipment during 5 presentations to kids with disabilities, and it was pure JOY, JOY, JOY! 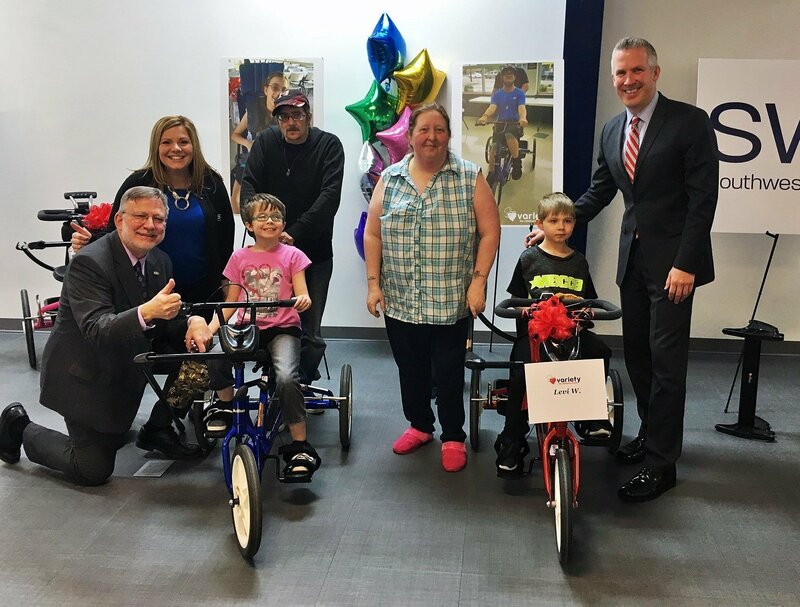 In partnership with the Central Intermediate Unit #10, Forbes Hospital, PlayWorks, Range Resources, and Saint Vincent Hospital, we presented 35 adaptive bikes, 15 adaptive strollers, and 32 communication devices (worth $123,900). Here’s a few highlights to smile along with us! 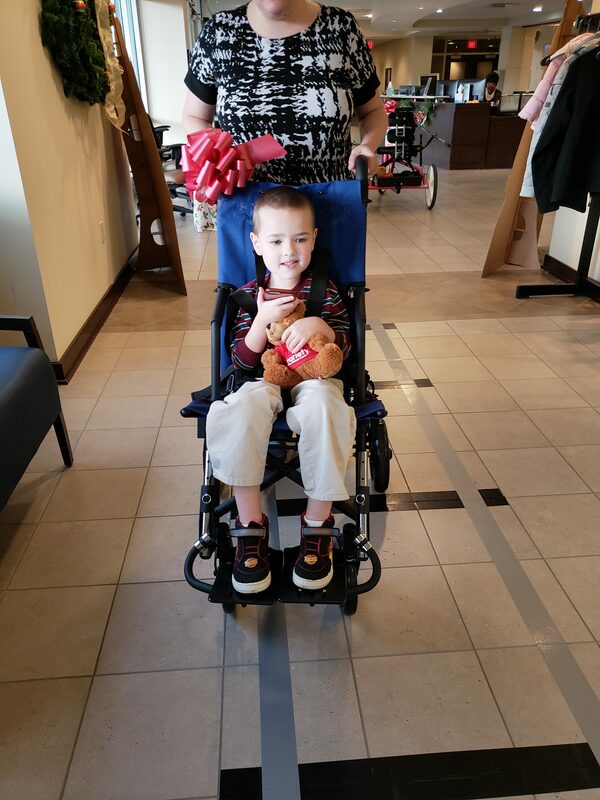 Zane is pictured above “all smiles” with his family on his new bike and showing off his new device. Zane received his new adaptive bike AND communication device during a presentation with PlayWorks in Morgantown, WV. 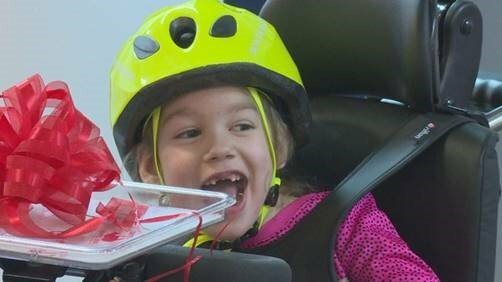 His mom, Autumn described the bike’s impact simply by saying, “Zane loves being outdoors. He struggles with a regular bike, so he usually chases his sister rather than getting to ride with her.” Now, Zane will get to just be a kid and ride bikes alongside his sister. Brylee immediately began checking out her new device (her new voice). “Though our daughter can be verbal, she really isn’t. 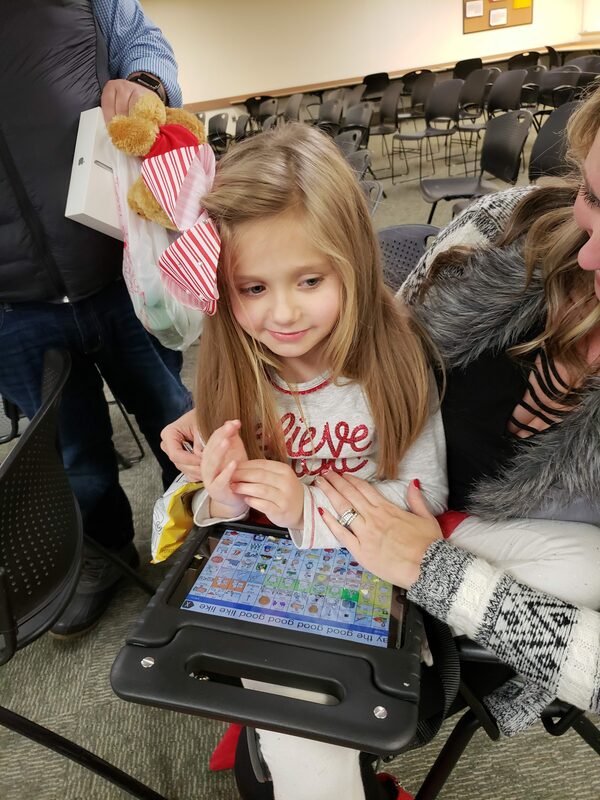 When you ask Brylee ‘how was your day,’ or ‘what did you do in school today,’ or ‘what do you want for dinner,’ her response is usually silence. On occasion she will give you just a repetitive response she has heard a million times and what she thinks to be the appropriate response, but it’s mostly a one-sided conversation…which has been one of the most heartbreaking things. Another big hurdle for us is not knowing what could be wrong with our daughter when she is sick, or when something is hurting her. When you have a child that just starts crying her eyes out for no reason, but cannot communicate to you that her belly hurts, or that she stepped on something and now her foot hurts because she has no way to communicate to you is very freighting. Noah is pictured above feeling comfy in his new stroller. 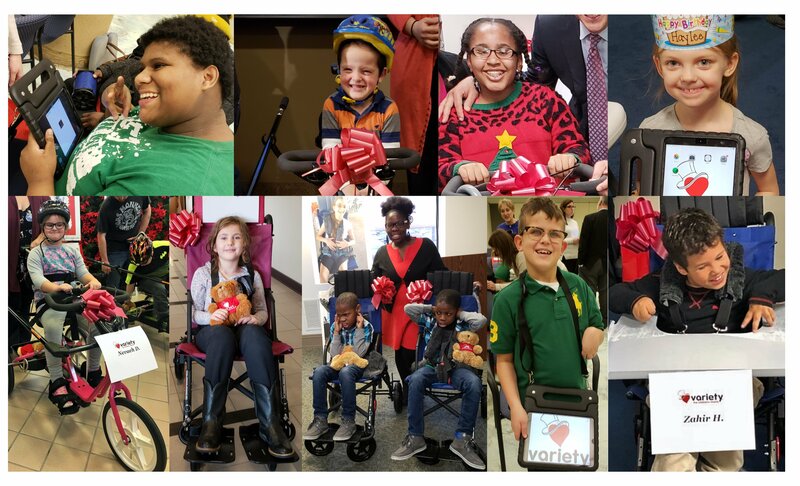 During our five recent presentations, we were grateful to have local media coverage, which will hopefully enable more kids to be identified and receive this life-changing equipment. 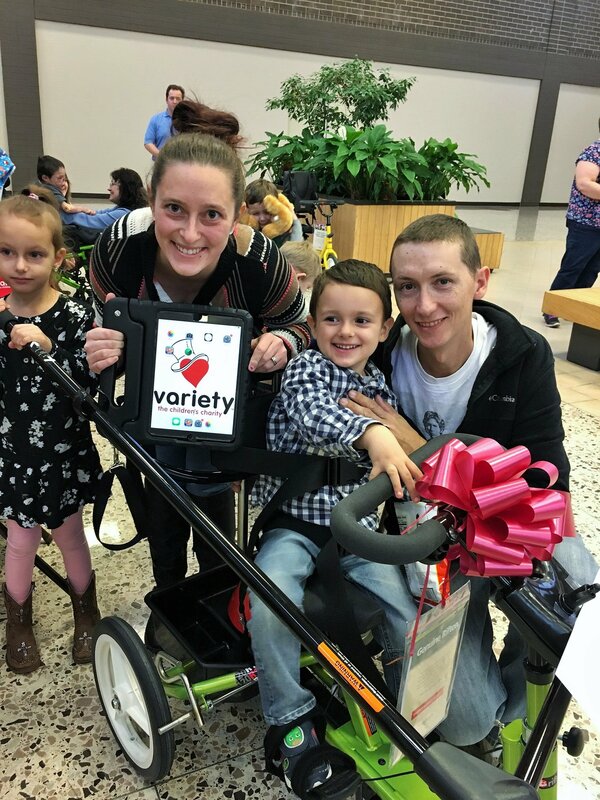 Click on the links below to share in Variety’s “Tour de Joy”. Ethan, age 6 received his new BLUE adaptive bike last Friday, September 28th, and he could not have been more excited. 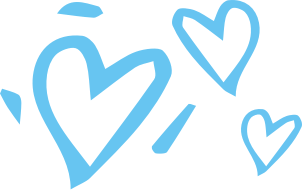 “At age 3, Ethan was diagnosed with autism and other conditions that led to him being delayed in every aspect. We have tried some bikes and tricycles since then, but none work as he can’t pedal. Ethan shows frustration and I really want him to learn this skill and have fun. Most importantly, I want him to have confidence from succeeding in learning how to ride a bike. Two months ago, Ethan tried an adaptive bike at therapy, and it was the first time he ever rode a bike. He was able to pedal, and he had so much fun. Yesterday, Qiying sent us the attached 7-second video of Ethan riding inside on a stationary stand, which Variety provides to every child. It is short, but sincerely sweet to watch him smile on his new bike. 28 Kids Impacted at Labor Day Parade w/ Biden! 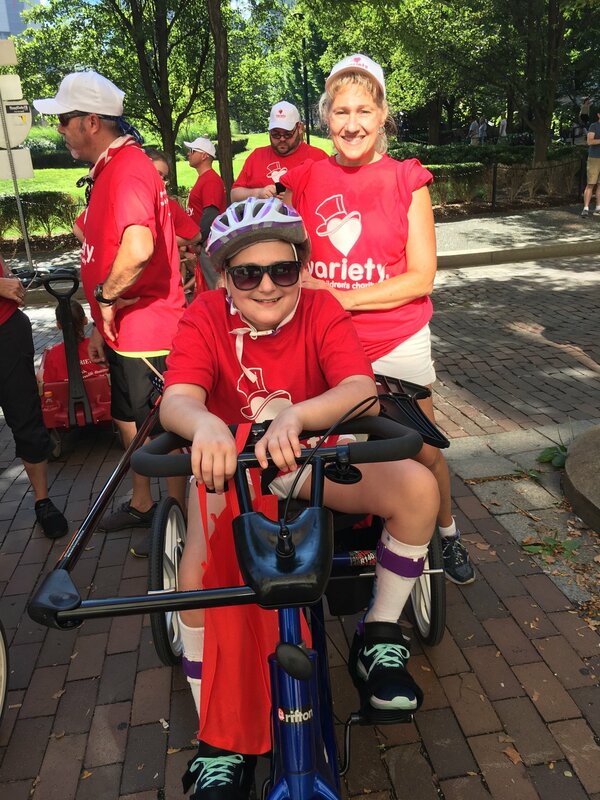 For the 5th year in a row, Variety was given the chance to participate in the Labor Day Parade through downtown Pittsburgh, and it was a record year for us! 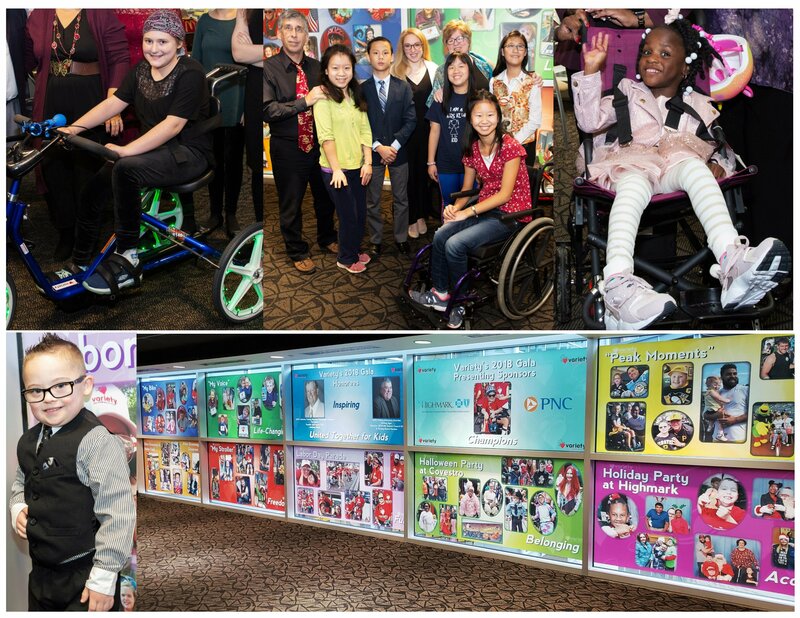 We had 28 Variety kids participate alongside more than 160 family members / partners. 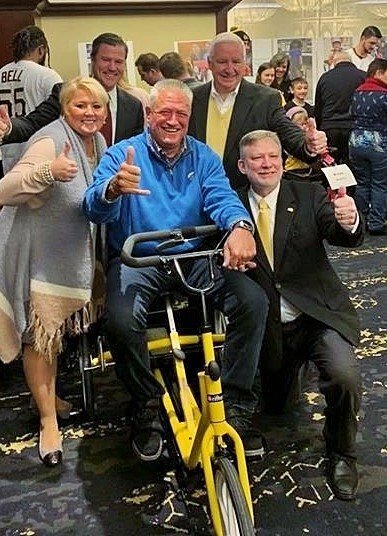 With special thanks to the United Steelworkers’ Leo Gerard, our kids were personally greeted by former Vice President Joe Biden, which was a huge moment for everyone! Steven is all smiles pictured above with Joe Biden! 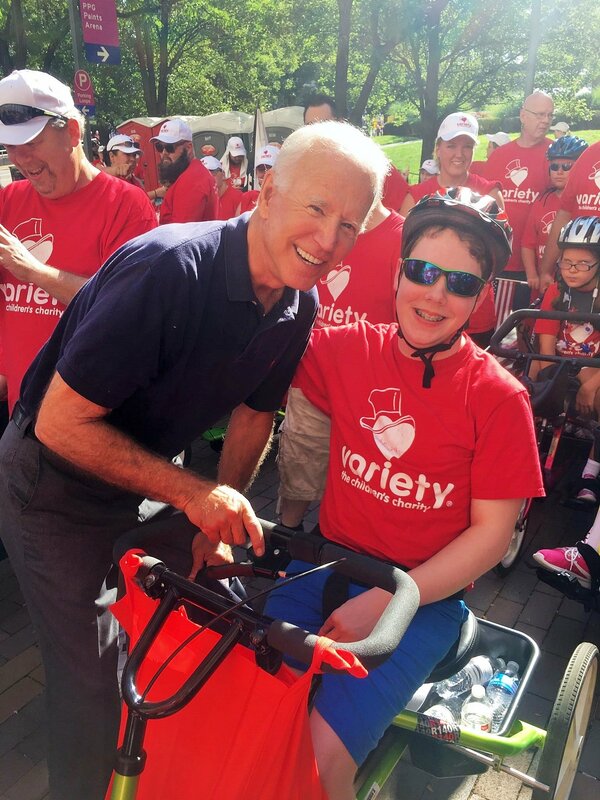 Steven was especially thrilled to see Biden once again, as he was featured on the front page of the New Castle News in 2015 when he got to meet the then Vice President at the Labor Day Parade. Gabby poses with her mom, Carmen above as she waits for the parade to begin! Each of our kids braved the heat on Monday with a smile, as they were celebrated and cheered on by parade attendees. 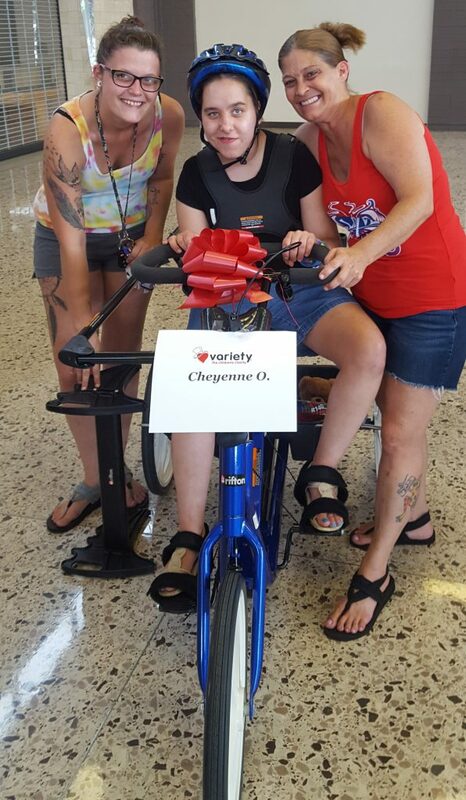 For Gabby, it was a significant day, as she hasn’t been able to ride a bike like she used to due to her battle with cancer. Riding her new bike in the parade on Monday was especially a big treat, since she had to get chemo treatment on Tuesday. You might remember Gabby from a recent update. She was the 12-year old who couldn’t wait to “pop a wheeley in the middle of the street” on her new bike. Both the TribLive and the Pittsburgh Post-Gazette featured photos of our kids with the Biden, in case you want to check them out by clicking either link. Most Incredible Variety Video EVER! This might be our most incredible video ever highlighting the impact of Variety’s “My Bike” and “My Voice” Programs. Once again, Variety was given the opportunity to speak to hundreds of labor leaders from around Pennsylvania this week. These labor leaders were deeply moved by the video (video above) and committed to doing even more for Variety. Plus, we were presented with a $3,000 check to sponsor another bike and device! 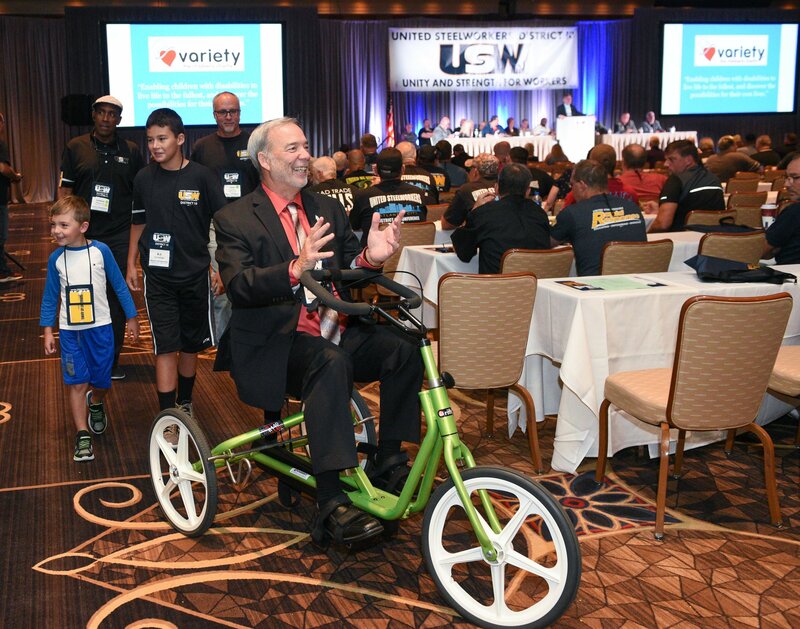 The experience was especially meaningful for USW District 10 Director, Bobby “Mac” McAuliffe, who rode an adaptive bike into the conference to great celebration by everyone in attendance (photo above). 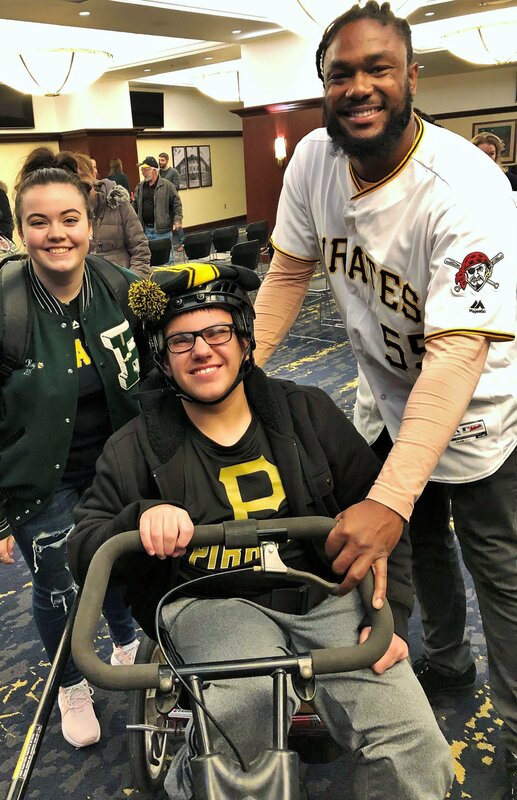 It was great for the attendees to see the USW Director for Pa. ride an adaptive bike and to realize how important the bike would be if it was their child or grandchild. 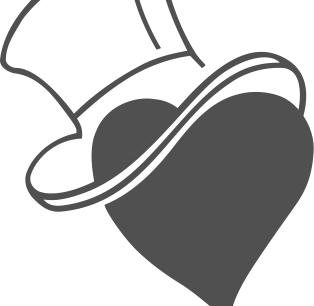 We are overwhelmed with gratitude by the support, commitment, and time that has been given to Variety and our kids, but we know how much more is still needed. Let’s keep things rolling forward, together!